Jon Shook and Vinny Dotolo of animal, Son of a Gun, and Jon & Vinny's of Los Angeles, Calif.
What do you love best about L.A.’s food scene? Jon Shook: LA has the best diversity of food in the country. JS: Koreatown. I’ve been in LA for 13 years and I still feel like I haven’t scratched the surface. VD: West Hollywood, adjacent to Center City Los Angeles. It’s where ours and a lot of other great restaurants are. Name your top five restaurants and dishes that you think every visitor to Los Angeles should try. JS: Mario’s Peruvian: It’s traditional Peruvian food that is delicious. These are a few of my favorites: lomos saltado and the pescado sudado. Ruen Pair: The salty turnip and egg, #105 on the menu. Rustic Canyon: Chef Jeremy Fox will never cease to amaze you with unique combinations and flavors. The menu is constantly changing. Matsuhisa: The tempura king crab with the vinegar sauce! Gjusta: Best bread in the city! We use it at Jon & Vinny’s. VD: Lomos saltado at Mario’s Peruvian. Bone marrow pie at Chi SPACCA. Almond milk latte at Go Get Em Tiger. Hickory burger and banana cream pie at Apple Pan. New style sashimi at Matsuhisa. Imagine you had a limitless appetite. Where would you go on your perfect dining out day? JS: I would start my morning at Nate ‘n Al’s, then I would go to the Farmers Market for some fresh fruit to eat as snacks. I’d roll to Matsuhisa for lunch, then to Madeo’s for dinner. To end the night on a sweet note, I would go to Milk for some ice cream. If you had to name one favorite item from each of your restaurants, what would they be and why? Foie gras biscuit with maple sausage gravy from animal. Photo credit: Brianne Chan. 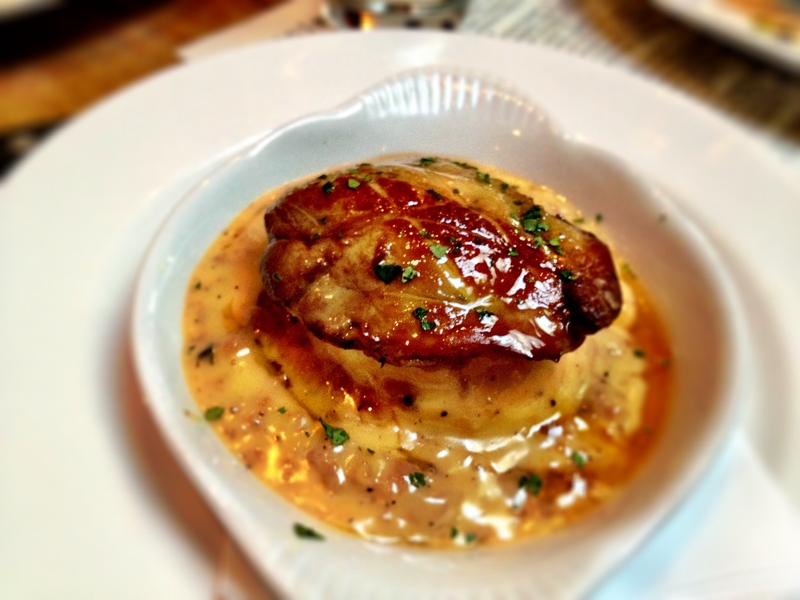 JS: animal: Foie gras biscuit and gravy. I love the dish. It holds a very special part in my heart. I think this dish holds a lot of the reason why animal is so successful. Son of a Gun: Smoked fish dip. I grew up eating smoked fish dip my whole life and now we have one that is indigenous to Son of a Gun. Jon & Vinny’s: Chicken parm. Personally, it’s a dish I would consider having as my last meal. Petit Trois: French onion soup. It’s my favorite soup! Trois Mec: The menu is changing all the time. But my favorite all-time Ludo [Lefebvre] dish is the panna cotta, caviar and caramel sauce. 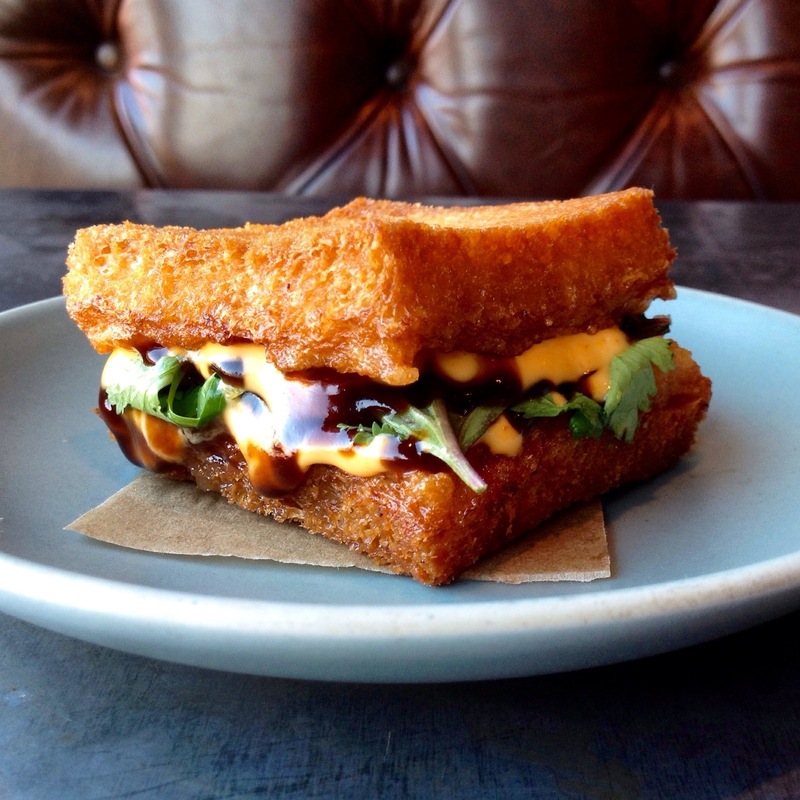 Shrimp toast sandwich with herbs and sriracha mayo from Son of a Gun. Photo credit: Brianne Chan. VD: animal: BBQ pork belly sandwiches. Son of a Gun: Shrimp toast. It made the menu final moments before opening and it’s been a huge hit since the beginning. Jon & Vinny’s: LA Woman. It’s one of the first things we came up with when thinking of items for the restaurant. It’s been such a huge staple to our menu. Petit Trois: Steak frites. It’s such a classic. Trois Mec: It’s hard to tell because the menu always changes. What are some of your favorite watering holes? VD: Tiki-Ti is my favorite bar. What are your go-to places for cheap and quick eats? What’s one dish you tried in Los Angeles that blew you away and left you wishing you came up with the recipe yourself? JS: Matsuhisu – the whole menu. I have my own personal menu that they do for me there. VD: The beef and bone marrow pie from Chi SPACCA. Since Eats Abroad is geared toward travelers, are there any restaurants or bars at the Los Angeles area airports or hotels you would recommend? JS: I love the spinning roof at the spinning bar at the Westin Bonaventure. I feel like all tourists should go to the Beverly Hills Hotel’s Fountain Room and have a drink in the courtyard at the Chateau Marmont. Since it’s Los Angeles, we have to ask: what’s your favorite place for Mexican food and what do you like ordering there? JS: My favorite place to get Mexican food is at our family meal. Raymundo, our sous chef at Jon & Vinny’s, makes the best family meal! It’s better than anything I’ve had at any Mexican restaurant. VD: La Abeja, the chile relleno. What’s your guilty pleasure and where in L.A. do you go to get it? JS: Candy and a hamburger from South Beverly Grill. VD: Ice cream at Salt & Straw on Larchmont. Finally, what would you say is the one thing any visitor must see or do before leaving Los Angeles? JS: Eat at all my restaurants! animal, 435 N Fairfax Avenue (Fairfax); nose to tail cooking, dinner only daily. Son of a Gun, 8370 W 3rd Street (Beverly Grove); seafood, lunch and dinner daily. Jon & Vinny’s, 412 N Fairfax Avenue (Fairfax); Italian, breakfast, lunch and dinner daily. Trois Mec, 716 Highland Avenue (Hollywood); French, dinner only Monday-Friday, closed Saturday-Sunday. Petit Trois, 718 Highland Avenue (Hollywood); French, lunch and dinner daily. Mario’s Peruvian & Seafood, 5786 Melrose Avenue (Hancock Park); Peruvian, lunch and dinner daily. Ruen Pair, 5257 Hollywood Boulevard (Los Feliz); Thai, lunch, dinner and late night daily. Rustic Canyon Wine Bar and Seasonal Kitchen, 1119 Wilshire Boulevard, Santa Monica, CA; new American, dinner only daily. Matsuhisa Restaurant, 129 N La Cienega Boulevard, Beverly Hills, CA; Japanese, lunch Monday-Friday, dinner daily. Gjusta, 320 Sunset Avenue, Venice, CA; bakery/deli, breakfast, lunch and dinner daily. Chi SPACCA, 6610 Melrose Avenue (Hancock Park); Italian, dinner only daily. Go Get Em Tiger, 230 N Larchmont Boulevard (Windsor Square); coffee shop, open daily. The Apple Pan, 10801 W Pico Boulevard (West Los Angeles); burgers, lunch and dinner Tuesday-Sunday, closed Monday. Nate ‘n Al of Beverly Hills Delicatessen, 414 N Beverly Drive, Beverly Hills, CA; deli, breakfast, lunch and dinner daily. Farmers Market, 6333 W 3rd Street (Fairfax); open daily. Madeo Restaurant, 8897 Beverly Boulevard (West Hollywood); Italian, lunch Tuesday-Friday, dinner daily. Milk, 7290 Beverly Boulevard (Fairfax); ice cream parlor/bakery, open daily. Second location: 1639 Silverlake Boulevard (Silver Lake); open daily. The Roger Room, 370 N La Cienega Boulevard (Beverly Grove); bar, open daily. Tiki-Ti, 4427 Sunset Boulevard (Los Feliz); bar, open Wednesday-Saturday, closed Sunday-Tuesday. In-N-Out Burger, multiple locations in the Los Angeles area. Chick-fil-A, multiple locations in the Los Angeles area. Bona Vista Lounge, The Westin Bonaventure Hotel & Suites, Los Angeles, 404 S Figueroa Street (Downtown); cocktail lounge, open daily. Fountain Coffee Room, The Beverly Hills Hotel, 9641 Sunset Boulevard, Beverly Hills, CA; American, breakfast, lunch and dinner daily. Bar Marmont, Chateau Marmont, 8221 Sunset Boulevard (West Hollywood); bar, open daily. La Abeja, 3700 N Figueroa Street (Cypress Park); Mexican, breakfast and lunch Wednesday-Monday, closed Tuesday. South Beverly Grill, 122 S Beverly Drive, Beverly Hills, CA; new American, lunch and dinner daily. Salt & Straw, 240 N Larchmont Boulevard (Windsor Square); ice cream, open daily. Los Angeles County Museum of Art, 5905 Wilshire Boulevard (Mid-Wilshire); open Thursday-Tuesday, closed Wednesday. About the Chefs: An instant bond over their love for food and cooking marked the start of Jon Shook and Vinny Dotolo’s friendship and eventual business partnership. The two met as aspiring chefs at culinary school at the Art Institute of Fort Lauderdale, and after graduating, they trained in the same kitchens and eventually moved out to Los Angeles together. In 2008, they took their first step as restaurateurs, opening animal. Diners were drawn to their nose-to-tail offerings, and Shook and Dotolo became culinary superstars in their new hometown, receiving national recognition from the James Beard Foundation and Food & Wine the following year. Their seafood restaurant, Son of a Gun, debuted next, and Shook and Dotolo partnered with Chef Ludo Lefebvre to open Trois Mec and Petit Trois. This past April, the duo debuted their latest concept: Jon & Vinny’s, a laid-back, Italian diner featuring comfort foods such as pastas made in-house and pizzas. And they’re not done yet. Though they plan on spending more time with their families and pursuing other lifestyle projects, Shook and Dotolo want to open more restaurants together, perhaps even curating an entire block.